Buying your first home is not easy. Especially post recession, when the banks tightened up on their lending requirements and consumer protection regulations have changed. The homebuying process requires discipline, commitment, and a willingness to climb the steep learning curve to becoming a homebuyer. However, interest rates are still a tremendous bargain and homeownership is extremely affordable. In most cities, owning a home is much cheaper than renting an apartment. If you are ready, this is the perfect time for you to pursue your dream of buying a home. A good credit history is one of the biggest stumbling blocks for first time homebuyers, second only to having enough cash for their down payment. Why is a good credit history so important? We mentioned that lenders have been tightening up on their lending requirements. That means they are looking for people with good credit histories. You can bet that your lending officer will be looking at your credit history and credit score. What will they be looking for? A high credit score. Lenders give the best mortgage interest rates to people with high credit scores (740 and higher). However, you may qualify for a mortgage with a credit score as low as 640 or in some special circumstances, even lower. The downside is that a lower credit score will mean you will pay higher interest rates, costing you far more money over the length of your mortgage than the cost to someone with a high credit score. Low credit scores can also mean you will be required to have a bigger down payment. If you are already struggling with your finances, coming up with even more cash to use for a down payment might prove very hard to do. A bad credit history may also tell a loan officer that you struggle to manage your finances. Do you have trouble paying your bills in full and on time every month? Do you have too much debt? When asking a bank for $100,000 to buy a home, they want to know that you can handle the payments and that they will get a return in the investment that they are making in you. What can you do when your credit history doesn’t measure up? If your credit history is not good enough to buy a home, you should take the time needed to improve your credit before you apply for a home mortgage. This means establishing an on-time payment record and paying down your debts. The Mortgage Ready program can help by turning your finances around. You will learn good financial skills, credit management and financial goal setting. https://www.homeownershipdayton.org/wp-content/uploads/2016/01/Ready-to-Buy-Part-1-Credit-History-800x533.png 241 800 Tim McMurdo https://www.homeownershipdayton.org/wp-content/uploads/2017/02/HOC_Web_Logo340x156.png Tim McMurdo2016-01-22 09:15:212016-09-27 13:59:09Is Your Credit History Good Enough to Buy a Home? 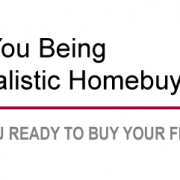 Are You a Realistic Homebuyer? Keeping Fluctuating Mortgage Rates in Perspective Have You Saved Enough Money to Buy a Home?